An evergreen carpeting plant, this ground-hugger is studded by tiny white flowers during late spring. 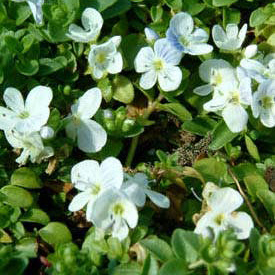 Ideal for growing between flagstones or massing as a groundcover over a small area. Dislikes extreme drought, but otherwise tough and versatile. A good cover for early spring-blooming bulbs.